Too much. What a joke! I would call it taking a calculated risk. They must believe that the pitcher they have is much closer to the one on their roster last year than the one in past seasons. Anything now not > $350 MIL a non event. Sox extended Eloy! Likely to start with Sox on Day 1. Happy for him, he is fun to watch. I believed the Twins should have gotten more for him, said so at the time. His stats after the trade only showed it more. Glad he’s finally hitting his potential. I thought the Astros gave up a lot. In retrospect, Pressly was better than I thought last year. Hope he keeps it up. Solid RP. I thought the Twins did well in every trade but this one. Pressly was underrated. Twins did pretty well in that trade, both guys have good upside. 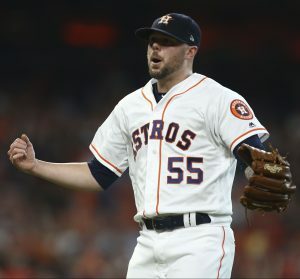 The Astros deserve credit for maximizing his talent but Pressly wasn’t exactly Mr. Consistent prior and his pre-trade numbers weren’t dominant outside of Ks. Doubt any teams were going to give much more. Glad he’s sticking around. If Sipp was worth $6 million per year and Joe Smith is worth $8MM, Presley is certainly worth $8.75MM yr. Problem is Sipp nor Smith are worth the money they got either…. And now I hear they are talking to Bregman. That’s what can happen when a game gets rained out. I can’t wait to see ticket prices this year. Ticket prices and contracts have no correlation. In any sport. There was a Duke/UNC college basketball game this season in which the starting ticket price was 2500 dollars. Ticket prices and costs do have a correlation. A college basketball game may not have salaries, but they also don’t have the revenue streams. Salaries are part of the cost. Nope. It goes by supply and demand. Exactly this. Teams will charge as much for tickets as the market will bear. That’s all. I honestly don’t think much of the revenue from ticket sales goes to player contracts. Most of that money doesn’t even leave the stadium. It’s not like the days when basically attendance was the entire revenue source. TV./Advanced Media/etc are where the big money comes from. The teams that have a legit reason to cry poverty – the A’s and Rays – don’t have the lucrative TV contracts nearly every other team enjoys. The Rays have had, in the past, the worst local TV deal, although they have been talking about signing a much better one for more than a year now. So sick of this misinformation and how smugly people try to pass it off as fact. Ticket revenue is enormous to teams. Absolutely enormous. So $144M in game day revenue is dwarfed by other sources? What other sources, exactly? Even if almost nobody attended the games, the team would still need to employ ushers, security, the team still needs a place to play, they still need lights, etc. Stadium operating costs are largely fixed. You speculate greedy vendors and captive audiences are the reason for skyrocketing concession prices? No. It’s the teams lease rates. Just like how airports have higher costs for food and drink, sports events have higher costs because leasing the space at stadiums is extremely expensive. Teams essentially push the price of leasing vending space to the highest bidder and that vendor determines a reasonable profit margin based on the cost of food/drink. It’s why you see a lot of vendors churn from year to year. It can be unprofitable unless the model works out great. Movie theater prices are so high because theaters make zero profit from the movie ticket prices. Ticket prices cover the cost of showing the movie only. All profits come from concessions. Different industry with completely different financial models. And I never said the vendors were greedy; I think it’s obvious, though, that they aren’t just charging 12 dollars for a beer because they’re eking by; they call it “stadium pricing” for a reason. We all know we can’t bring in our own food and drink, and the concessions are priced to maximize profit. The reason for the “churn,” as you call it, might be because it’s a ton of work to try to run a business that’s only open around 100 days a year. Staffing and supply issues are a nightmare for stadium concessionaires. In our situation, the beer markup paid for the food, which was basically a break-even proposition. Restaurants operate on a razor-thin margin as it is – they make so much more money on alcohol because there’s no real overhead to serving it, as opposed to serving food. Our lease, as I understood it, wasn’t remotely prohibitive; we paid a fee at the beginning of the season and we could set our own prices. We did pay a % of sales but it wasn’t crazy. We could have still made money charging 6 dollars for a beer, but why do that when we can charge 12 dollars? As I wrote earlier, prices are what the market will bear. I quit that job after one year because it’s really hard to keep a job that only operates 100 days a year when you have a family and such. Well he was one of the best, if not the best reliever the second half of the season. Well he got about the same as relievers like Bryan Shaw, Joe Smith, Addison Reed, Anthony Swarzak, Kelvin Herrera, Tommy Hunter, Darren O’day, Adam Ottavino, Juan Nicasio, Andrew Miller, and Zack Britton. 11 of the top 19 paid relievers. All non-closers; granted Ottavino/Britton are kinda cheating since they’d probably be a closer if they didn’t sign with the Yankees. Most of those have been setup men that get the occasional save, just like Pressly. Why does it even matter if they’re not used as a closer during their contract? Sure, most of them are probably overpaid but that’s the price for great relievers. Sure, argue it based on facts, not feelings. With this comment you’re demonstrating that your knowledge and reasoning regarding this situation surpasses the Astros’. I’m interested to know what his comps are and why he deserves no more than six mil per season on a two year FA deal. And yet majority of those players signed to be something other than closers. The only relievers from that list with notable closer duties are Britton, Miller, Herrera. Smith had 1 short run 5 years ago. The rest of them got like 5-7 saves, which is normal for setup men. Ex, Pressly had 2 saves in 26 opportunites with the Astros, so 5-6 saves is entirely possible. This isn’t “everyone [jumping] on the bandwagon” though. This is the team that probably targeted him in a trade; his high spin rates follow the Astros pitching ideology; and seemingly improved his game by a lot. I completely get wanting to wait longer until signing him, but given the Astros believe in Pressly they simply didn’t want him to test FA. Closer salary is way higher than $9M / year for players at Pressley’s age. Even if he’s just a 2WAR player going forward you’d have to exceed 20M a year to be “overpaying”. There is literally a way to measure whether contracts are over or underpays but sure stick to your subjective mindset lacking anything resembling context. You’re definitely in the majority with that BS approach…so there’s that I guess. God baseball fans are so dumb when it comes to valuations. Makes me happy; he is a guy who kind of slogged through as a middle reliever, always close to being released or DFA’d, then modern analytics and data basically improved him greatly – 101 Ks in 71 innings! He’s going to actually get paid and it’s a testament to the way teams are finding hidden gems. The Padres are terrific at this, of course, but so is Houston. And good for Pressly. A few years ago he was just a generic up and down guy, seeing time in the minors every season. What’s with the fascination of him not being a closer? That’s the most overrated position in the game. Saves don’t mean jack. Yep. Saves are a stat that was made up to describe an action, which is just sort of weird. And the “proven closer” thing is just absurd anyway and teams are moving away from it in favor of exploiting optimal matchups and other factors. Putting your best pitchers in the highest-leverage situations is the key, and those situations aren’t always in the 9th inning with a 3-run lead. And because of the expanded definition of the “save” rule over the last few years, it’s even a less-essential stat..
Here’s an example: on September 24th Kirby Yates came into a game with a five-run lead in the 9th and two outs. Bases loaded. He got one out and got the “Save” because the tying runner was on-deck. The Padres won 5-0 and he got a save. by throwing 4 pitches and striking out someone named Austin Slater. That’s not a remotely high-leverage situation. I’m dissapointed that an extension was signed, and it didn’t break the new record. The Twinkies NEVER learned HOW TO USE HIM. They finally gave up. Give much credit to Houston to figuring Pressley out and harnessing his potential. And that is also why Pressley signed an extension to remain with the Astros. I would LOVE to see him “stick it” to the Twins whenever he faces them. I agree and that is a definitely a negative against the front office. To their credit though, I think they did recognize that some things were not right internally seeing Pressly’s remarkably quick & improved performance. Over the offseason, there were a ton of organizational changes which included an overhaul of the coaching staff and some major changes in the way data is presented to players. Hopefully, this will lead to us getting more out of players and seeing some diamonds in the rough (i.e. Perez) that are brought in reach their true potential. You have to look at the whole picture. The Astros now have their 8th and 9th inning guys locked up for the next 3 seasons. This year they are paying Osuna and Pressly under 10 million dollars combined. Then that number will grow to about 17 million next year and maybe 20 million the third year as Osuna moves up in arbitration. Meanwhile, the Yankees are paying over 30 million for Chapman and Britton. Statistically, Osuna and Pressly outperformed Chapman and Britton last year (ERA, WHIP). The Red Sox lost Kelly and probably Kimbrel, and now they are going with non-proven late relievers. The Rockies are paying 25 million this year for Wade Davis and Jake McGee. The Dodgers are paying 24 million in AAV for Jansen and Kelly. The Giants are paying Melcancon and Smith 24 million this year in actual salary and 20 million in AAV. Also, the reliever market next year appears to be weak. Pressly would have likely been one of the best relievers available. The other names that are free agents after this season are Cody Allen, Tommy Hunter, Betances, Cishek, Addison Reed, and Will Smith. With another season like last year Pressly would have been at or near the top of that list. He wasn’t very good with the Twins. Definitely a guy who can get some K’s, but over the course of a season, he misses a lot of pitches and struggles with command. We’ll see. Pressley was heard to say, “Thank You, Thaaaannnk You Verrrrry Much”. Yes I have always felt that saves were overrated because u can pitch to 1 guy and get a cheap save….u can also throw just about any guy into that role and they will rack up 20+ saves in a season….I am simply saying that while Pressly had a good season look at his track record and u will not see consistency….I just feel that 5-6 mil for 2 years would have been fair and then if he has 2 more solid season then jump to 9+ per year….also mentioned above was the fact that he outperformed guys making more than him….I get that but for 1 it was just 1 season and for 2….none of those guys are worth that much….in my opinion they are all over paid to play a game but it is what it is….soldiers and police officers make $40k-90k based on rank etc….but baseball players minimum salary is way above that just for the scrubs on the bench….so tell me how these guys are worth the money….they may produce and put people in the seats but better players 30-40 years ago did it for pocket change….it has gotten out of hand and will only get worse….how is any one man worth 25-30 mil for 1 season of playing a game? Simple economics – baseball brings in tons of money and the players are paid accordingly. Can’t compare them to soldiers and cops. Apples and oranges there. And most cops I know make 6 figures, or close (and none of them are high up). Also I know several police officers and deputies and the area I live in is very expensive and salaries are higher here than most places because of the economy and none of them make 100k….most make between 6k to 7k per month unless they are the Captains and Commanders in which case they make 100k to 150k per year or 10k per month….even then someone like Matt Joyce has made more than these heroes ever will…. The short answer here is that cops are paid by taxpayers and baseball players are paid by the free market. The police don’t generate income and baseball players do. Want higher salaries for cops? Lobby for higher taxes. . If we want to argue about value related to jobs, I mean, there are teachers in public schools who have to buy their own supplies There are volunteers who go to other countries to vaccinate children. Nurses are criminally underpaid, even when they work for private entities. I’d love to see a more equitable system than what we have, but whenever anybody proposes raising taxes to pay for schools or police officers or to fix crumbling infrastructure people freak out about it. Yes, there is a valid argument, and it is that police and Navy SEALS don’t generate income and baseball players do. We live in era of historically low tax rates, and people whose jobs are funded by taxpayers – like the police and military and teachers – are the ones who are going to bear the brunt of that.